MANATEE T-SHIRT (TODDLER/YOUTH) -"MUMPHREY, MINDY & MAX MANATEE SINGING"
MANATEE T-SHIRT (TODDLER & YOUTH SIZES) "MUMPHREY, MINDY & MAX MANATEE SWIMMING"
NEW Gildan toddler basic tee. Pink - 100% cotton. Cincinnati Gymnastics T Shirt is NWT and size Youth M or 7/8. Comes from a smoke free home. Please see my photos for visual detail. Thanks for looking! 100% Cotton knit construction. 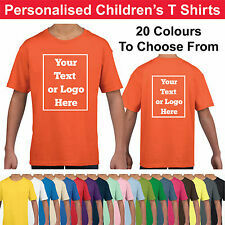 Orange short sleeve Gildan Heavy cotton. Machine washable. Bright orange, with a graphic of a gator on the front says Florida Gator Girls rule the south. You will receive 1 pink and 1 purple. Mossy Oak Graphic. txzj pxzj2607 txzj1. Mossy Oak Graphic. 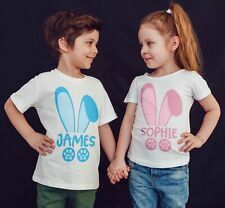 Girl's T-Shirt. NWT Beantown Boston. Preshrunk Cotton Shirt. 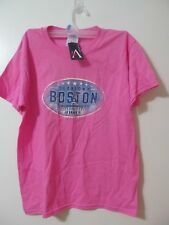 Pink Children's Short Sleeve. New With Tags! 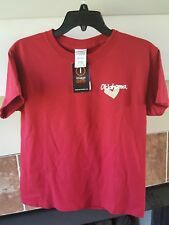 Girl's Oklahoma University Sooners Youth Medium T-Shirt Great Girl's Oklahoma University Sooners t-shirt. Show school pride and look great in this 100% cotton shirt. This shirt is NEW WITH TAGS and without flaws. Great shirt for school or casual wear. Thanks for looking! New With Tags! Girl's University of Louisville Cardinals Youth Medium T-Shirt Great University of Louisville Cardinals t-shirt. Show school pride and look great in this 100% cotton shirt. This shirt is NEW WITH TAGS and without flaws. Great shirt for school or casual wear. Thanks for looking! Sleeve (shoulder to end of sleeve) 6½”. Length (collar to bottom hem) 23”. New With Tags! 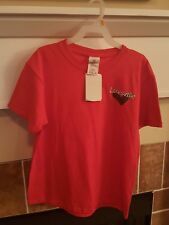 Girl's University of Arkansas Razorbacks Youth XL T-Shirt WOOO PIG SOOIE! Great Girl's University of Arkansas Razorbacks t-shirt. Show school pride and look great in this 100% cotton shirt. This shirt is NEW WITH TAGS and without flaws. Great shirt for school or casual wear. Thanks for looking! GLITTERY FARM GIRL FRONT. CLASSIC STYLE, CLASSIC LOGO.